LifeScience Plus, a biotech company that has developed an innovative, life-saving product that every family should have in their first-aid kit — BloodSTOP, recently featured on Gizmodo and Popular Science Radio, is a product that stops bleeding, prevents blood loss, and seals even serious wounds better than any other in existence. With school back in session, parents are likely already prepared and ready to take on the new school year. However, one critical thing that often goes forgotten during this busy time is the replenishing of your first aid kit. Even though summer is winding down, kids are just as active as ever — whether they're competing in sports, enjoying recess, riding their bike to school, or just playing in the backyard, scrapes and cuts are bound to happen and can get in the way of learning, extracurriculars, and outdoor fun. 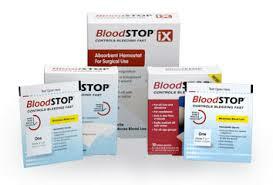 Having BloodSTOP on hand not only keeps kids moving, but it also gives parents peace of mind. BloodSTOP is an absolute must-have addition to every family's first-aid kit and is available at major drug stores nationwide (e.g., CVS, Walgreens, Rite Aid, Walmart, Amazon, and more). When applied to a wound, BloodSTOP® quickly absorbs blood and other body fluids, transforms into a gel to seal the wound with a protective transparent layer, actively aids in blood coagulation, and creates an environment for wound healing. This is a very interesting product. I was very impressed with it and the ability it had to stop a cut that was bleeding. I had a very minor cut on my hand from cutting some fruit. Thankfully it wasn't a bad cut, but I applied the BloodSTOP bandage to to area, and it didn't take long for the bleeding to stop. 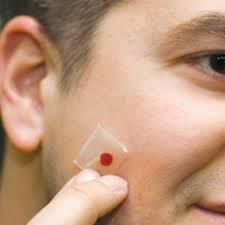 The gauze actually attaches to your skin over the spot where you're bleeding. 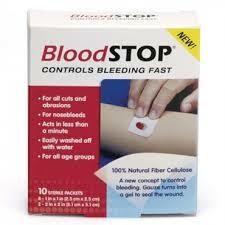 Once bleeding stops, you can rinse away the gauze with water and the cut will be clean. This is one of those items you want in your diaper bag or purse at all times, because you never know when someone might get hurt. These also stay in my bathroom for my husband for when he nicks himself while shaving, which usually results in a cut that doesn't want to stop. I was very impressed with these and had my doubts when first getting it, but this is one of those products that proved me wrong and was better than I thought it could be.